It’s Black Friday season time and the week Best Buy posts its earnings. The consumer electronics retailer is expected to post its third-quarter earnings before the market opens on Tuesday, Nov. 20 — just 3 days before the sale kicks off. Best Buy is expected to post quarterly earnings of $0.85 per share for the quarter, up 9%, on revenue of $9.54 billion. It has had a good streak of beating earnings estimates. For the previously reported quarter, Best Buy beats estimates of $0.83 per share and posted earnings of $0.91 a share — a 9.64% surprise. For the previous quarter, the consensus estimate was $0.75 per share, while it actually produced $0.82 per share, a surprise of 9.33%. However, all eyes would be on the Black Friday sale and how it turned out, as investors usually focus on the present and not the past for Best Buy. Even as last quarter earnings were a beat, shares fell on lower-than-expected outlook. For the third quarter of 2019, Best Buy announced that it expects enterprise revenue of $9.4 billion to $9.5 billion. 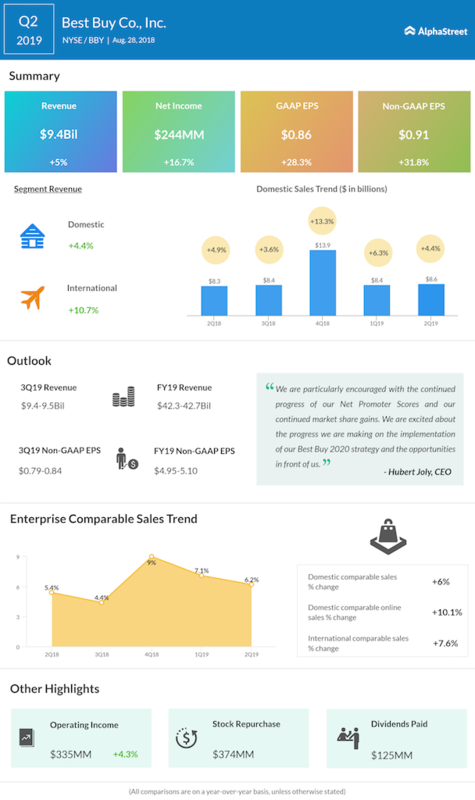 Enterprise comp sales are expected to grow by 2.5% to 3.5% while adjusted diluted EPS is expected to increase 1-8% to $0.79 to $0.84. This was much below what the investors were looking for.